naijablog: Fatai Rolling Dollar goes rolling..
Feb 5th at Salamander Cafe, Abuja (gate fee N5k). 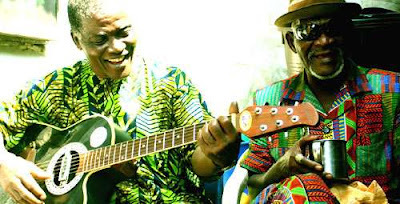 Faaji master Rolling Dollar will be accompanied by Sina Ayinde Bakare (guitar virtuoso) - playing songs from their new album out on the Jazzhole label. I want to go, but why is the Abuja one so expensive? Why should we have to be the one to pay the cost of hotel and air ticket bills. I protest about this outrageous charge. Then again, who cares what I think. The organisers probably think I am not their target audience. So I better just shrruup!! I don't understand why everything in this goddam country has to be so exclusive and for the elite. and I can't believe Jeremy is helping to promote this. Maybe you are in on it. Salamander cafe is a joke. They are so greedy! imagnie paying $30 for an omelette and two cups of coffee. Just outrageous. I don't know if jeremy is actually in on it, financially speaking, but he is implicated in its ideology. He thniks of himself as a "cafe phiolosopher" therefore he must support the "cafe". he also once replied to a thread on abuja expats telling someone who complained about the prices in salamander to stick to something more "their level", like mama cass or mr biggs.